Embroidery is in itself a full-fledged institution on distinct aspects of embroidery. Embroidery magazine is published in the UK and comes with just six issues in each year. Buy a single copy or subscription to Embroidery magazine. Embroidery magazine is in itself a full-fledged institution on distinct aspects of embroidery. Embroidery magazine is published in the UK and comes with just six issues in each year. Embroidery magazine glorifies the developments which have taken place in the arena of embroidery not only in the UK, but across the world. Embroidery magazine provides answers to the queries which can strike an individual's mind regarding the origin and history of the art of embroidery. All the articles based on contemporary and modern style of embroidery forms an eternal part of this informative magazine. The articles also highlight the distinct aspects such as machine based embroidery and newer stitched drawings for its readers. Embroidery magazine also hints at the latest manifestations in the arena of embroidery taking place in the various parts of the world. Through such pieces of news, the readers get acquainted with the recent changes which are moulded in the various countries and how well the audiences have received such exhibitions. Embroidery magazine is a perfect fit for both the accustomed embroiderers and beginners. Those who fancy about the challenging version of embroidery, surely get a great source of inspiration in the form of the Embroidery magazine. The trickiness and intricateness of the ideas directly hits on the vital sense of inquisitiveness of the embroiderer. Embroidery magazine is quite modern and avant-garde in its appeal. 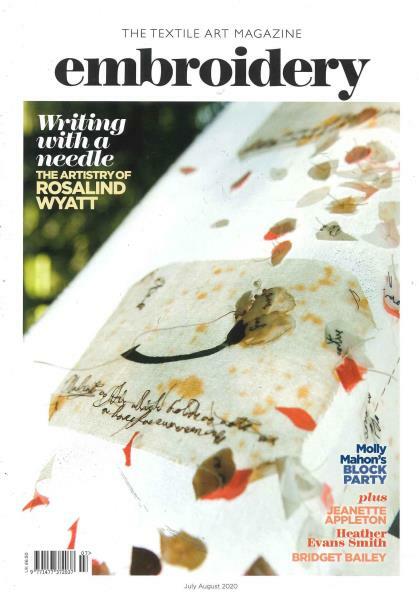 Instead of focussing on the usual and often repeated sections on how to knit and design a great piece of embroidery, the magazine offers something unique and of much value to its readers. The articles contained in the magazine tell about the how the techniques of embroidery have evolved in different countries and what lessons others can learn from their progress. A simplistic layout is the weapon of this intriguing magazine, with cover full of amazing designs and depictions with embroidery as the underlying idea. Embroidery magazine caters to each and every need of an embroiderer. Subscribe to Embroidery magazine today. Lovely magazine, always excited to get each new issue. Gives me ideas and information.